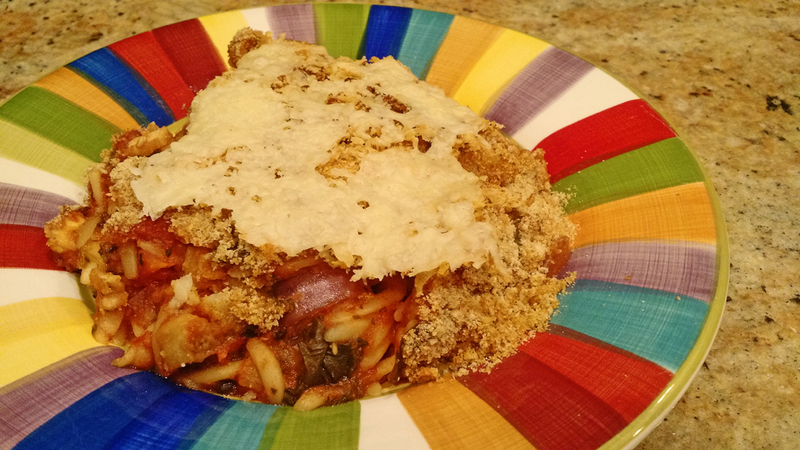 Eggplant Parmesan casserole is a take an oldie, but goodie. My boyfriend loves chicken Parmesan, but with my vegetarian(ish) status, I've been trying to switch out meats for more vegetables. We had an eggplant on hand so chop, chop, chop it went and a casserole was born. I may or may not have been feeling a bit too lazy for the traditional eggplant Parmesan, but sometimes things need to be switched up anyways. The eggplant and orzo add great bite to the dish with the traditional Italian flavors of garlic, basil, and red pepper. Spinach adds a bit of green (I'm a firm believer that every meal should have something green) while the breadcrumbs and Parmesan topping create the traditional crunch you crave from, well, traditional eggplant Parmesan. Take a shot at this easier spin on traditional Eggplant Parmesan casserole. 3Spray an 8 x 8 baking dish with cooking spray. 5In a medium bowl, combine tomato sauce, vegetable broth, basil, garlic, chili flakes, and white wine. 7In baking dish, combine orzo, eggplant, spinach, tomatoes, and red onion. 11Cover and cook for 1 hour. 13Remove from oven and increase temp to 415 degrees. 15Top with breadcrumbs and grated Parmesan cheese. Let cook, uncovered, for 15-18 minutes, or until golden brown. 17Top with the shaved Parmesan cheese. Enjoy!